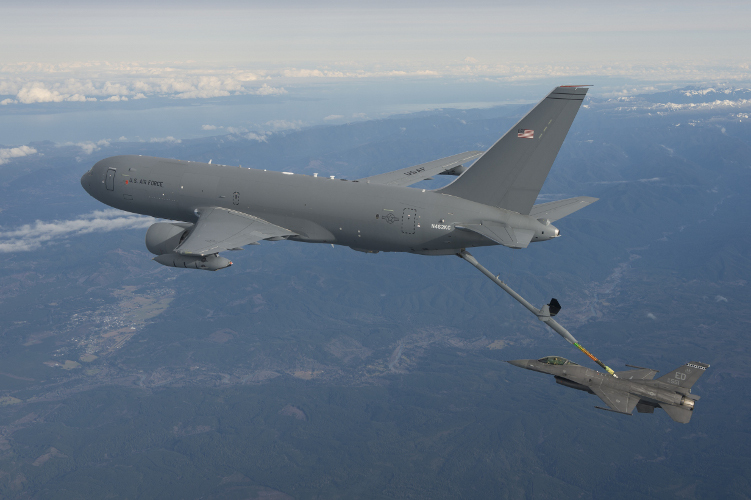 Boeing and U.S. Air Force crews complete the KC-46A Pegasus tanker’s first refueling flight following takeoff from Boeing Field in Seattle. The Boeing/Air Force test team aboard the KC-46 offloaded 1,600 pounds of fuel to an F-16 fighter. Photo credit: Paul Weatherman, Boeing. SEATTLE, Jan. 24, 2016 – Boeing [NYSE: BA] and U.S. Air Force aircrews successfully completed the KC-46A tanker’s first refueling flight today in the skies above Washington state.